SureBets are also known as "Sport Arbs" or just "Arbs". It is a sure bet because at some moment the odds differential between the competing bookies leads to an opportunity where you could bet on all outcomes for some event and will win no matter the result of the game. 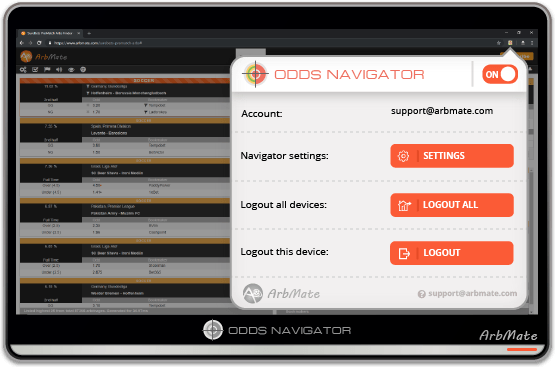 ArbMate scans the bookies each few seconds and finds thousands of such opportunities each day! Middles arbitrages are something between gambling and sure betting. They are the perfect way to combine your regular and sure betting skills. You must place a sports arbitrage for a match to end with a specific result. There is a small risk but the profit is higher than normal sure bets. This betting method is recommended for advanced bettors. Polish Middles are the same as the Middles but with the opposite rule - the match must NOT end with a specific result. Here the risk is higher than in Middles but the profit is also bigger. It's recommended to deal with sure bets first before jumping straight into this way of sports arbs betting. Only purchased customers can post a review.